Dr Patrick Tarrant has received a BFI nomination in recognition of his experimental nature documentary. 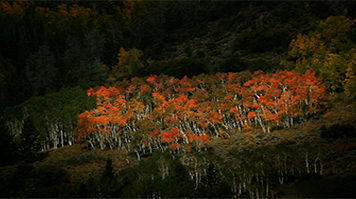 It remediates the landscape in Fish Lake Utah in the American south-west, which is occupied by a clonal colony of quaking aspen trees, also known as The Trembling Giant. The colony is thought to be the largest living organism in the world but, having survived for sixty thousand years, is thought to now be under threat by human existence. Dr Tarrant’s short film, shot through a spinning 16mm film reel, forces the viewer to remodel and change their perspective of vision as the space in front of the camera warps, which in turn creates a stunning yet unusually unnerving effect. The Trembling Giant will be screened alongside a film by New York filmmaker Ken Jacobs, who has been experimenting with the relationship between propellers, intermittent light and 3D effects for many decades. “It was Jacobs' work that gave me the idea of filming through the holes in a projector's film reel - treating the film reel itself as an intermittent aperture, or propeller - as a way of sculpting the space in front of the camera. It's said that the bark from the quaking aspen tree provides one of the 38 Bach flower remedies, and is thought to be the cure for any fear whose cause can't be named. The film showed at Haverhill Experimental Film Festival (US) in July 2016 and will screen again in October 2016. It will also be screened in the Jihlava International Documentary Film Festival in Czech Republic. The winning short will be announced by BFI on 15 October 2016. "It is unusual for an experimental film to be considered for an award alongside narrative shorts, so I find that an interesting but also very positive situation. Find out more about film courses at LSBU, and the BFI London Film Festival and Short Film Award.